Unique Latte Frothing Disc: Spins at the bottom for gourmet smooth and silky froth. Unique Cappuccino Frothing Disc: Spins at the bottom for gourmet thick and creamy froth. Hot Chocolate Maker: Easily makes high quality delicious hot chocolate. Easy Disc Storage: Stores the various discs in a compartment on board. Easy Clean: Simply put the jug in the washing machine for an easy cleaning job. 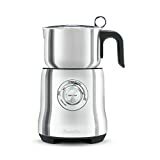 With a premium milk frother like the Breville model, creating a perfectly crafted cappuccino, latte, or even a hot chocolate is truly a work of art. Before I found out about automatic milk frother's, I would do this painstakingly with a hand frother. This was tedious work, but worst of all frequently turned out to be a lower quality than I originally envisioned. As a coffee enthusiast, roasting, grinding, and blending my own coffee could easily be ruined by a bad froth layer on top. Think about it. That is the first thing people see and the first thing you generally taste when drinking. A first impression can be a lasting one. Thankfully, I made the investment in a Breville Milk Frother and I am here to share some of the PROS and CONS that I have found using it. Versatility: I absolutely love how this frother can be used for both latte's, cappuccinos, and hot chocolate (and pretty much everything in between). It both heats milk and froths it according to your settings input. Intuitive Interface: The central dial on the front of the frother is easy to use, simple, but also a huge value added service because it allows for a good deal of customization as well. Depending on how you like your froth (or heated milk), you can adjust the dial accordingly. Simple Cleaning: The simple construction of this device means that it really is a cinch to clean. Just take out the containment beaker and wash in the dishwasher and that's it! Other forther's I have used and tried in the past have been a real hassle to clean. It is clear that Breville thought about this when they designed their frother. Plenty of Milk Capacity: Again, a common complaint with other forther's is that they are relatively small and cannot accomodate larger servings. Not so with the Breville Milk Frother. Especially if you are hosting and need a lot of froth quickly, this is the ideal device. Gourmet Quality: Most of the competition doesn't even come close. 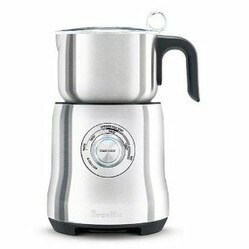 It is clear that Breville really understands the frothing process and engineered this into their product. Other frothers can be inconsistent and far too bubbly to be effective. The Breville delivers Starbucks like quality for a fraction of the cost. Heating Customization: Some milk frother's really only have one setting, or at best you will have to watch the device like a hawk for it to boil. This sometimes results in scalded milk. Very unpleasant. The Breville Milk Frother has adjustable heating settings according to want you need and desire (via the dial on the front). The main problem I have seen is that over time the magnetic disc that spins to froth the milk can slow down over time. This is entirely due to sugar from the milk that gets built up and secreted on the disc, thus slowing it down and messing with the magnetism. Thankfully, the easy solution is to clean the discs after each use. Breville makes cleaning extremely easy so this should not be a problem for most users. See the milk frother in action! I purchased the Breville frother thinking it would be easy to clean and froth well. It does not froth well with either of disks included. It takes longer than other frothers to heat. I give it 1 star because of its poor performance.